Constructor from a vector expression. Reverse the order of elements in the VectorMutable. Exchange elements i and j. This is the yat interface to GSL vector. Reading and writing vectors to file streams are of course supported. These are implemented without using GSL functionality, and thus binary read and write to streams are not supported. Allocates memory space for n elements, and sets all elements to init_value. Either elements should be separated with white space characters (default), or elements should be separated by the delimiter sep. When delimiter sep is used empty elements are stored as NaN's (except that empty lines are ignored). The end of input to the Vector is at end of file marker. This function performs element-wise division, . Check whether VectorBases are equal within a user defined precision, set by precision. True if each element deviates less or equal than d. If any VectorBase contain a NaN, false is always returned. This function performs element-wise multiplication, . Comparison operator. Takes linear time. Const reference to element i. Multiply with scalar and assign operator, . A const reference to the resulting VectorBase. Addition and assign operator. VectorBase addition, . 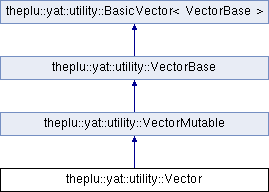 A const reference to the resulting VectorMutable. Add a constant to a VectorBase, . Subtract and assign operator. VectorBase subtraction, . Subtract a constant to a VectorBase, . Invalidates views and iterators of Vector. A const reference to the resulting Vector. Underlying GSL vector is destroyed and a view or an iterator into this Vector becomes invalid. number of elements in the VectorBase. Check if all elements of the VectorBase are zero. True if all elements in the VectorBase is zero, false othwerwise. Get the maximum value of the VectorBase. The maximum value of the VectorBase. Locate the maximum value in the VectorBase. The index to the maximum value of the VectorBase. Get the minimum value of the VectorBase. The minimum value of the VectorBase. Locate the minimum value in the VectorBase. The index to the minimum value of the VectorBase. Create a VectorBase flag indicating NaN's in another VectorBase templat. The flag VectorBase is changed to contain 1's and 0's only. A 1 means that the corresponding element in the templat VectorBase is valid and a zero means that the corresponding element is a NaN. Space for vector flag is reallocated to fit the size of VectorBase templat if sizes mismatch. True if the templat VectorBase contains at least one NaN. The output operator for the VectorBase class. Create a vector sort_index containing the indeces of elements in a another VectorBase invec. The elements of sort_index give the index of the VectorBase element which would have been stored in that position if the VectorBase had been sorted in place. The first element of sort_index gives the index of the least element in invec, and the last element of sort_index gives the index of the greatest element in invec . The VectorBase invec is not changed. Similar to sort_index but creates a VectorBase with indices to the k largest elements in invec. Similar to sort_index but creates a VectorBase with indices to the k smallest elements in invec. Calculate the sum of all VectorBase elements. Swap Vector elements by copying. The two Vectors must have the same length. GSL_error if Vector lengths differs. pointer to underlying GSL vector. Should always point to same gsl_vector as const_vec_ in base class does. This pointer should by used for mutable operations. Do not use this in const functions; use const_vec_ inherited from BaseVector.